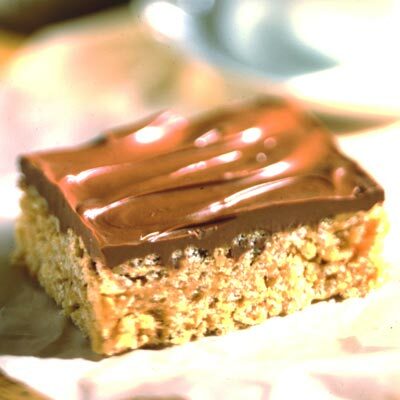 Chocolate Butterscotch Cereal Bars are a satisfying snack that is ready in minutes. Great for after-school snacks or casual entertaining. COMBINE sugar and corn syrup in large, heavy-duty saucepan; bring just to a boil over medium heat. stirring constantly. Remove from heat; stir in peanut butter. Stir in cereal. Press into prepared baking pan. MELT chocolate and butterscotch morsels in medium, uncovered, microwave-safe bowl on MEDIUM-HIGH (70%) power for 1 minute; STIR. The morsels may retain some of their original shape. If necessary, microwave at additional 10 to 15-second intervals, stirring just until smooth. Spread over cereal mixture. Refrigerate for 20 minutes or until firm.